I have written quite a few books which include canine characters and thus often find myself asked to do strange things in the name of publicity. I have judged dog competitions, judged short story competitions about dogs, been to visit a veterinary surgery with a reader, taken my own dog to an event to publicise my books and "meet" my readers. However, by far and away the strangest event I was invited to was one sponsored by the Kennel Club called "Bark and Read". 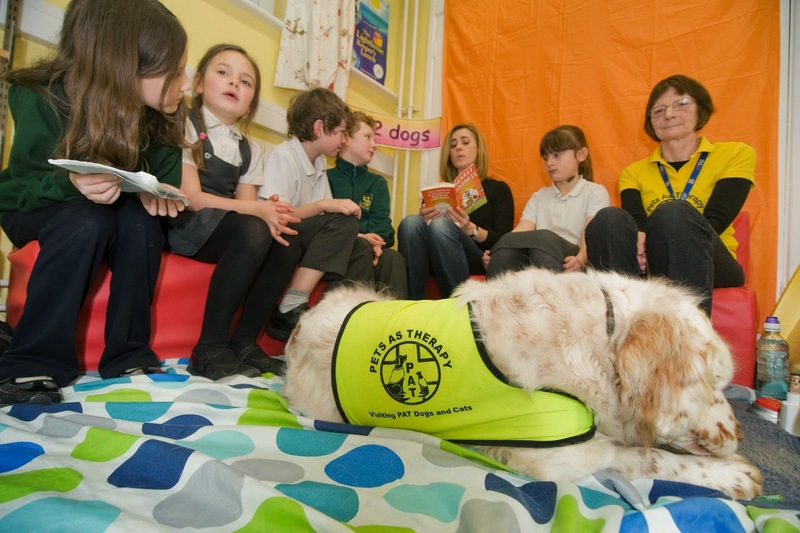 In schools where there are a number of children who have difficulty reading aloud, specially trained dogs from the Pets As Therapy scheme can be sent in at lunchtime to sit and listen to children read. I was asked to attend such a session at Vallis First School in Frome in Somerset, near where I live. I took some of my books and was asked to read some of my stories to the visiting dog, Percy, a Clumber Spaniel. Percy was adorably gentle and quiet and sat and listened attentively as I read about my fictional dogs having adventures, getting into scrapes, and solving mysteries. When I finished, Percy patted an electronic button which announced I had done a "Good Job!" The children, who were extremely shy at meeting me, relaxed when they saw Percy listening to me read and were soon clamouring to have a go themselves. The teacher explained to me afterwards that the children in the group all had learning difficulties or were suffering with tricky home lives, and that this time with Percy once a week was giving them a quiet space in which to practise reading aloud and enjoying stories without worrying if they were making mistakes or reading books that were "too babyish" for them, etc. Recently my sister mentioned that my nephew was not enjoying reading aloud and was becoming quite anxious when asked to do so at school. His teachers had suggested he practise at home, but he was reluctant to do that too. I told her about the Bark and Read scheme as my sister has two lovely Labradors who I thought might be good listeners. 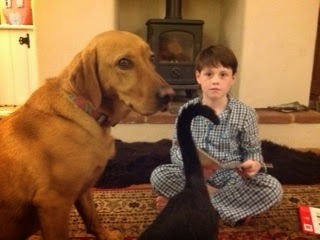 She immediately jumped at the idea of her son reading to the pets. And it has worked! 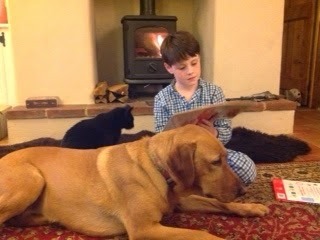 My nephew now asks if he can read aloud to Scooby and Teasel, the Labs (and the cat, Wormy, not to be outdone, has slinked his way in on the act as well). I would highly recommend this approach to anyone who has a child struggling with reading. I have a feeling that any pet would enjoy a good book. I know our tortoise is not averse to a bit of bedtime storytelling. So if you have a reluctant reader and can get your hands on a willing pet, put the two together and you might just see something magical happen. Aww that is soooo sweet! Anything that gets kids to read gets my vote! The Bark and Read scheme is growing all the time. 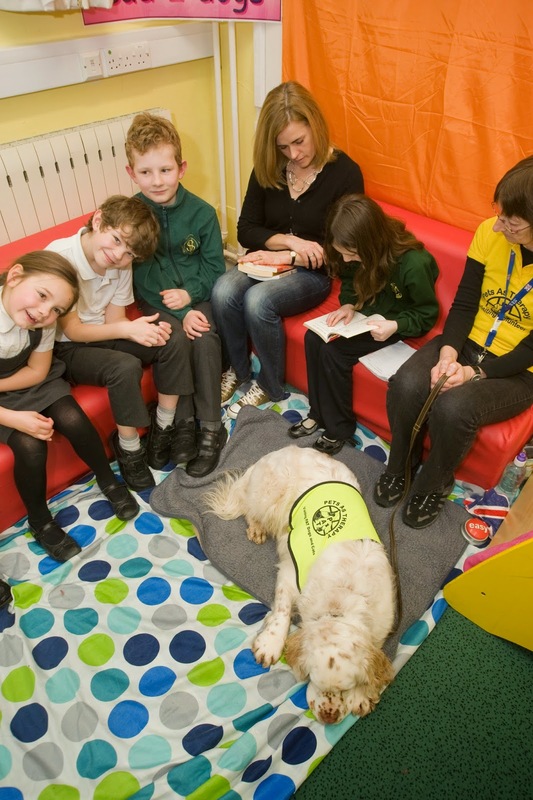 The thing that touched me most when going into the school was seeing the kids really open up in front of the dog. They were so shy and unconfident until he arrived. The power of man's best friend is unstoppable! Wormy the cat. Love it. What an unusual and lovely idea. Looking at the links I was trying to find what areas they covered (eg Norfolk? ), but couldn't find the info (maybe I didn't look hard enough). Is it national?